Bloodied and betrayed, John invites the demon Pazuzu into his body in order to heal his wounds. Now Chas, a harried Zed and an incredibly reluctant Anne Marie must work together to prevent the demon from escaping into the world and save John's life in the bargain. Swamp Thing #37 (introduction of Anne Marie, The Brujeria and The Invunche), Hellblazer: Original Sins (John using a demon to heal himself, The Resurrection Crusade and Zed's background) Hellblazer #11 (references to The Newcastle Incident), Hellblazer: Dangerous Habits (John using demons to heal himself) and Hellblazer: Hard Time (John taking over a prison where he's been locked up). The entire ensemble does a fine job, as we get to see all of our cast together in a single episode for the first time. The direction on Zed's visions continues to be amazing. The lighting throughout the episode is very atmospheric and moody without obscuring the action. The idea of John seeking demonic intervention to heal his injuries is not without precedent. In Original Sins, John undergoes a blood transfusion using demonic blood in order to heal his injuries. And in Dangerous Habits, John forces three powerful demons to cure his lung cancer. John's taking over a prison from the inside may be a reference to the Hard Time story line, where John did the same thing in an American prison while serving time for a murder he didn't commit. John's nickname in prison is El Diablo - The Devil. The First of the Fallen offers temporary power to mortals, eventually turning them into his possessions. John likens demonic permintion to the flu, noting there is an incubation period between the first infection and full possession. John estimates that he has a few days before Pazuzu can take him over but owing to Pazuzu's strength and/or John's overconfidence, it takes a bit less than that. Chas notes that Pazuzu was the Assyrian god of famine, locusts and storms. John has a tape-recording of himself reading exorcism rituals in 50 languages, including Assyrian in his kit. John also possess a ceremonial Tibetan Phurba. A phurba is a ritual knife which symbolizes the destruction of obstacles. It can also be used as an offensive weapon against hostile spirits. Up until a certain point, Holy Water causes a violent reaction when sprinkled on a possessed person. Nahash is the Hebrew word for 'serpent'. It is one of the names used to refer to the physical manifestation of earthly temptation. Other titles include The Trickster, The Tempter and - most recently - Vincente. He was the serpent in the Garden of Eden and was set free by the Brujeria purely so that he could aid them in destroying the world of Man with no other promises or expectations. Nahash is a shapeshifter and it can take on the forms of people it has killed by slithering inside of their bodies. When one of the Nahash's physical forms is destroyed, it breaks into a swarm of snakes. Until they fully take over a human body, demons are vulnerable to anything that effects the physicality of their host. To that end, strong sedatives (i.e. enough heroin to kill a herd of elephants) can be used to disable a demon and its host. Anne Marie is capable of crafting complex illusions with her magic. Either that, or she is able to change the appearance of her biolocation form. Either way, she uses some kind of power to create an image of herself in nothing but her underwear to distract the guards and she, Chas and John escape from the prison. Pazuzu is too powerful to be warded off by a recording of John's voice. It takes true faith and conviction to banish a demon king. Under normal circumstances The Roman Catholic exorcism ritual requires a fully ordained priest to perform. However, it can also be performed by any devout Catholic who has undergone a divine epiphany or otherwise seen first hand proof that Heaven and Hell exist. Manny: To save yourself from Hell, you acted without considering the consequences. It's not that I can't help you, John. I won't. Manny: I've got to admit - I never thought you'd do anything THIS stupid. John: I'm John Constantine. I do stupid in spades! Zed: John talks to an angel. Anne Marie: What did you say? Zed: His name is Manny. He came to John for help. You kneel here, night after night, hoping against hope that Heaven hears your words. Well, guess what?! John has Heaven on speed dial! Someone up there thinks he's worth a damn and now he's dying because of you! Zed: Should I be scared? For John, I mean. Anne Marie: He's in a bad way. But John believes he has every situation under control and he makes you believe. That's his magic. And his curse. Anne Marie: And if you're wrong? John: Well, then I'll go out riding the world's greatest high. With my first love at my side. Zed makes reference to 107, where she learned of Manny's existence. Zed grew up near a prison and knows something about how hookers are snuck inside of them. Averted hard as Zed escapes from her captors on her own and Anne Marie proves essential to saving John Constantine. 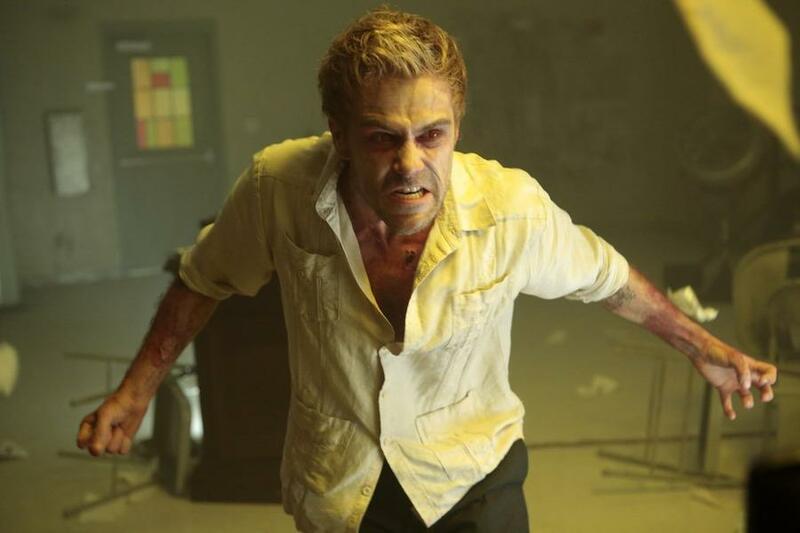 Granting that he was in dire straits, inviting a demon into his body in order to heal a bullet wound is foolhardy even by John Constantine's standards. Not quite as intense as Part One, but the leisurely pace does allow the entire cast a chance to shine as we get to see John's friends come to the foreground as Constantine is incapacitated for the better part of the episode. A welcome return to form after the break.